Dr.Parakrama Dissanayake – Chairman of Sri Lanka Ports Authority (SLPA) speaking at the seminar. “Production is taking in place Asia only because there was consumption demand in the United States and the West. Therefore, the production was outsourced to Asia. 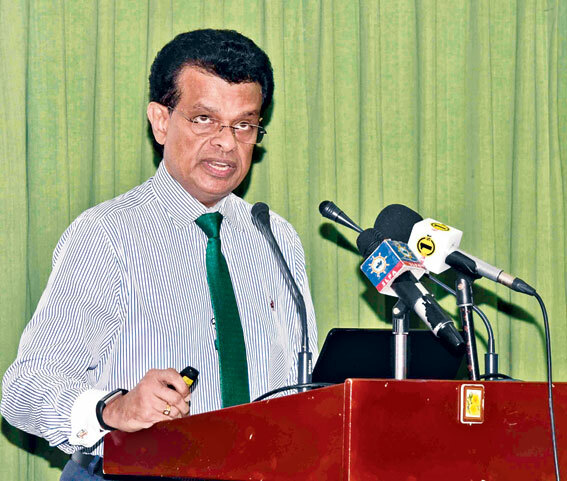 This model is changing and has changed, to near-shoring and re-shoring which is placing a huge challenge to the carriage of goods by sea, out of Asia,” said Chairman Sri Lanka Ports Authority (SLPA), Dr. Parakrama Dissanayake. He also stated that the outsourcing model into Asia had been challenged due to increase in cost in Asia, loss of employment in the US and Europe and the adverse situation pertaining to the creation of new employment in the developed world. “We need to understand that the demand for the carriage of goods is a derived demand and it is derived out of demand for trade. Ports and shipping have to follow trade,” he said. The Ceylon Chamber of Commerce had organized the seminar at its auditorium with a series of presentations on the Hambantota Port and the Industrial Zone. Several experts and professionals in the maritime transportation business expressed views through presentations at the seminar. Dr. Dissanyake said due to the huge investment required, the port had to be ‘demand driven’ and the ports in Sri Lanka were ideally positioned to seize opportunities provided they continued to create the competitive advantage required in the changing global environment. Dhara Wijayatilake – Secretary General and CEO of the Ceylon Chamber of Commerce moderated the seminar.